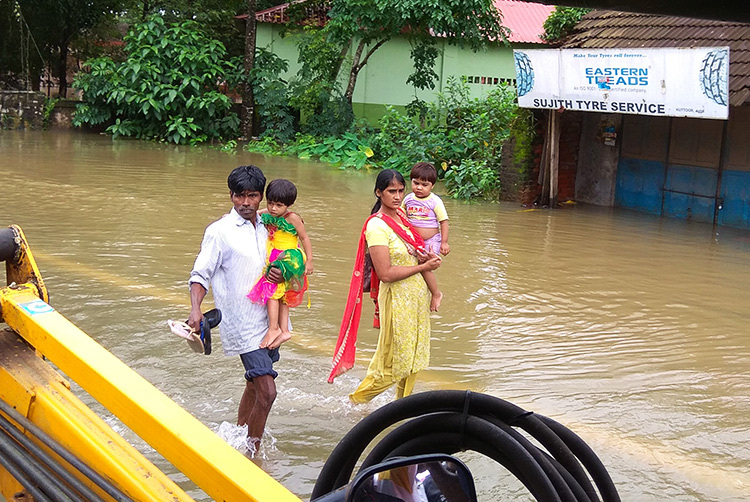 In August 2018, the South Indian state of Kerala experienced the worst flooding in nearly 100 years. Monsoon rains pummeled the state, causing an unprecedented increase in rainfall and dams to fill to dangerous levels of capacity. Around 430 people lost their lives, while nearly 1 million people had to be evacuated. 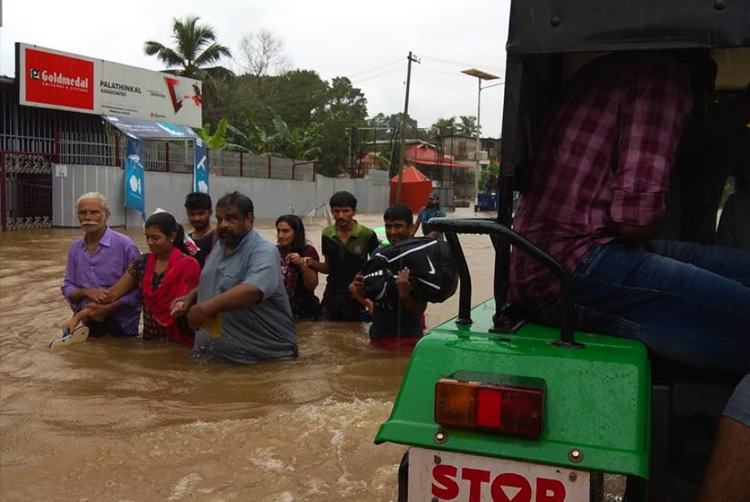 GFA-supported pastors, missionaries and workers living and serving in Kerala immediately began rescuing stranded people, providing shelter and delivering food and water to those in need. GFA-supported workers are continuing to minister to those affected by the flooding by offering practical assistance, support, prayer and comfort in the name of Jesus. Please join us as we seek to offer long-term relief to the survivors. 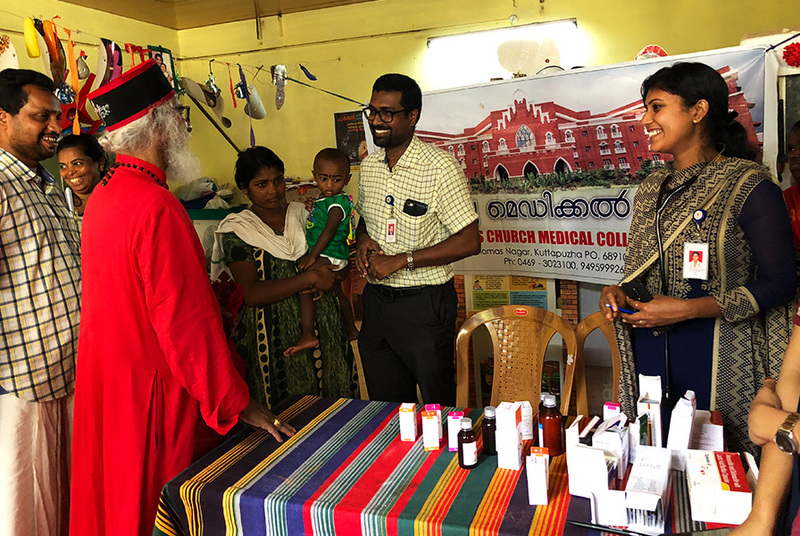 Dr. Daniel, director of GFA-supported medical ministry in Asia, reflects on the flood situation in Kerala and his trips to rescue people who were stranded. 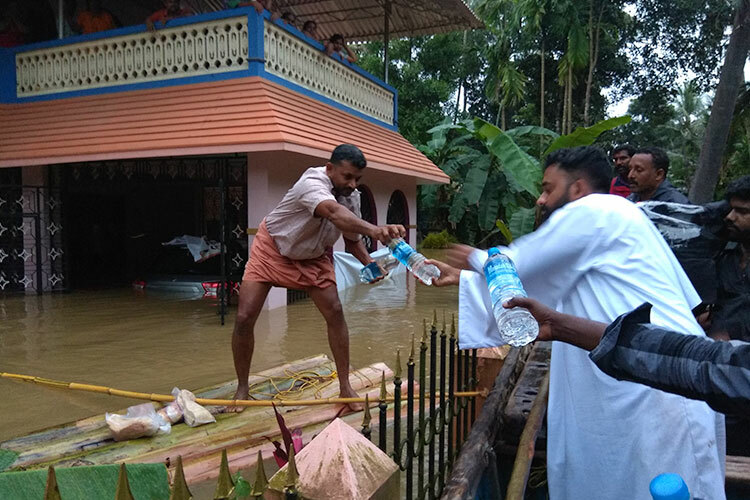 As GFA-supported workers in Kerala rescued stranded people in neck-deep floodwaters, distributed relief items and served around the clock in medical camps, behind-the scenes missionaries worked along with them. Dr. K.P. 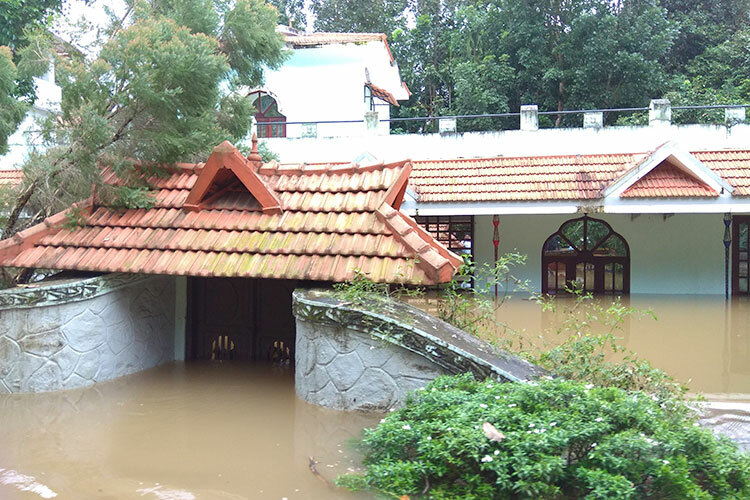 Yohannan, director and founder of GFA, shares the latest on flood relief and rebuilding work in Kerala, India. “My dear friends, even though the floodwaters have receded, the crisis remains. Recovering from a natural disaster—especially one as large as this—may take years. Because of the generosity of people literally from around the world, we are able to move forward with the rebuilding and recovery phase. “Because we have brothers and sisters living and serving in Kerala, we will be with these flood survivors for the long haul. We will help as many as we can. We will help them clean their homes, rebuild their houses and provide them with income-generating gifts to restore their lost livelihoods. We will minister hope in the name of Jesus and share His love in word and in deed. As reported, the intense sun and change in climate has also been killing massive amounts of earthworms, which habitually come up from the soil after heavy rains. This is problematic for many farmers in Kerala, as the earthworms are helpful for the soil. Today, many villages are struggling to have enough drinking water for their daily needs because some rivers have begun to dry up. The Indian government is bringing water rations in these areas to help the people in this time of lack. 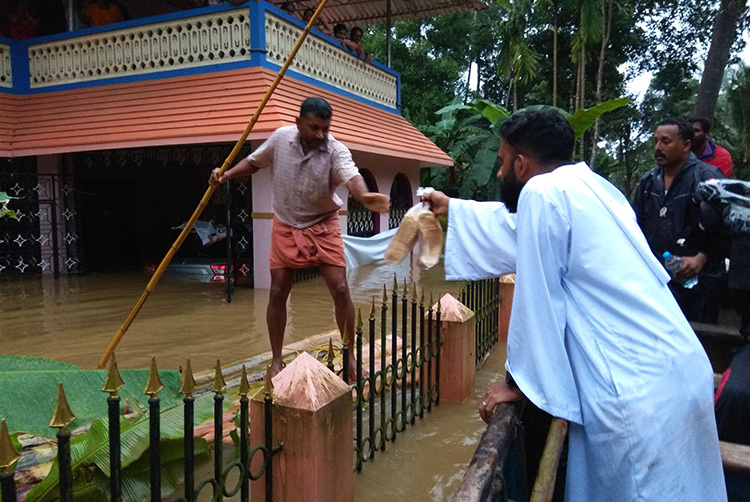 As the flood survivors of Kerala continue to clean their homes and rebuild, GFA-supported pastors and their congregations have not stopped taking care of those who are homeless and struggling. 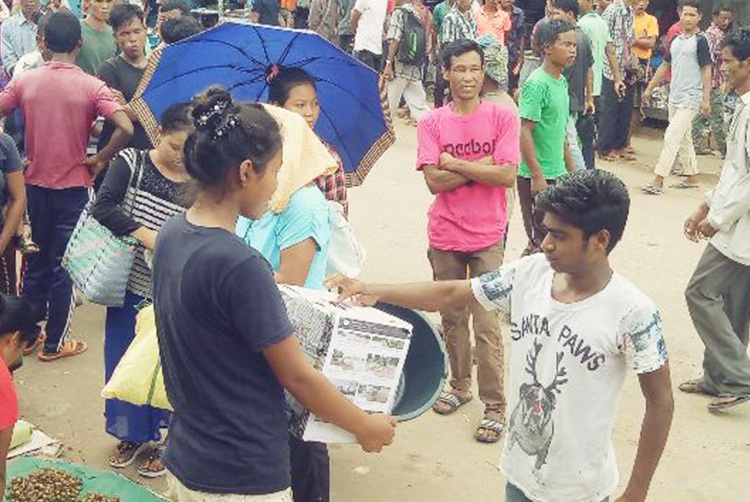 On August 23, a group of local believers distributed items to 55 flood-affected families taking shelter in relief camps. 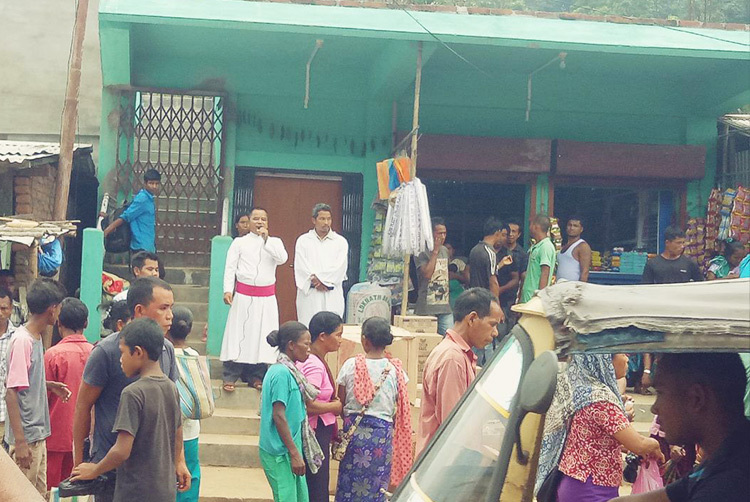 "Many families lost their house and items in the flood," GFA-supported pastor Tahaan said. "Those families are staying in relief camps. … Church members visited the relief camp and helped the families with their needs. When we learned that still there are people in the camp who are in need, we also came to distribute the basic items in this area." As families received needed items through the money raised by the believers, they were touched by the love of God in their time of need. But the struggle to get back on their feet continues. Many of them have lost everything. "Last four days, my family [has stayed] in the relief camp," said one man taking refuge in a relief camp. "But we are thinking about our house and agriculture fields. Now I hear that our house and agriculture fields have almost spoiled. We are in a painful situation now." Please continue to pray for all those affected by the Kerala flooding. There remains much work to be done and still many more trials to overcome in the coming months. With more than five confirmed deaths of leptospirosis, also known as "Rat Fever," Kerala, India, suffers not only under the destruction of the floodwaters, but now a disease that is spreading across the state. 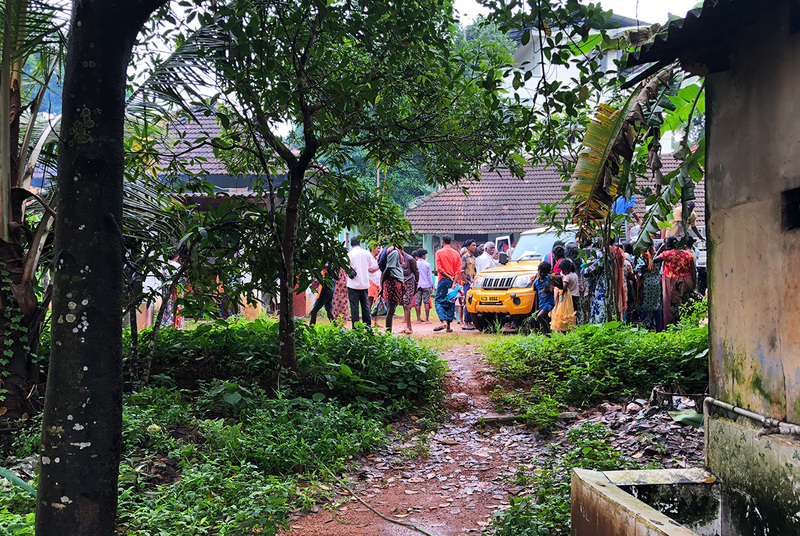 Bride-to-be Ammu and her family were rescued from their home on August 18, as Kerala, India suffered the downpour of the monsoon rains that triggered severe flooding. While the Kerala flood crisis grew worse, the wedding date originally set for August 21, was postponed until the 27. As the days drew nearer to the new wedding date, Ammu and the family could not return to their home because the floodwaters had not receded enough to conduct the wedding ceremony where they had planned. Ammu's father related this predicament to the village authorities while they were still taking refuge in a relief camp for flood victims which is supported by GFA's field partners. They received permission to hold the wedding at the relief camp. The village authorities gifted the young couple with gold and a member of the Indian government gave Ammu a wedding saree. 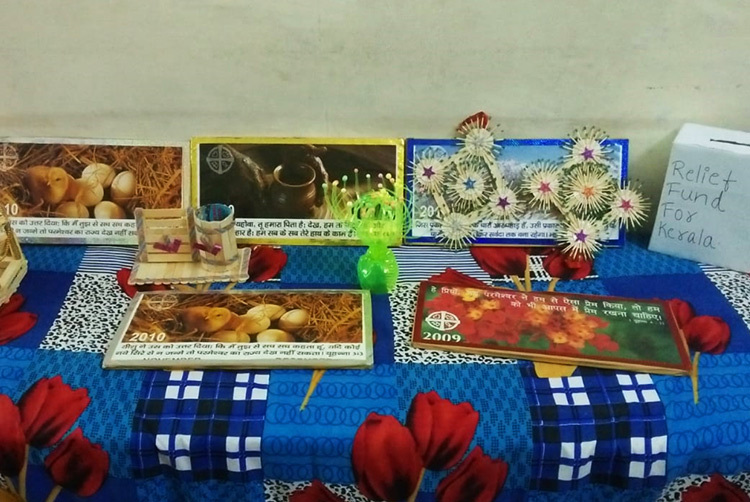 Though the wedding was simple, neighbors pitched in to get decorative items for the ceremony and they arranged the school for the wedding day. 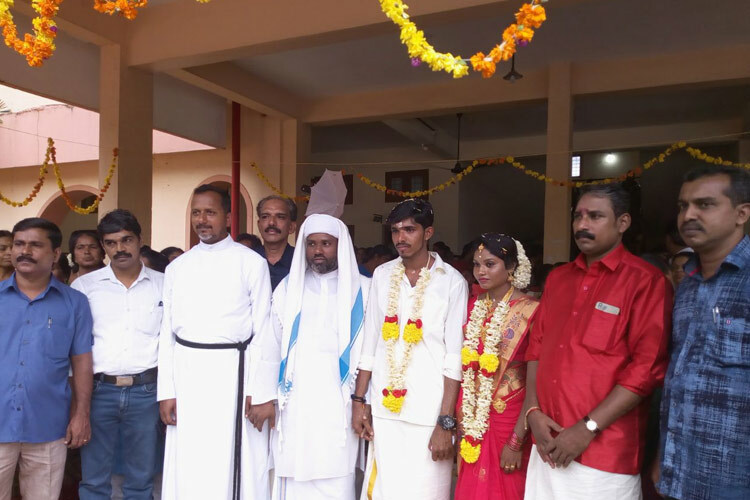 GFA-supported pastor Jair was present at the ceremony, and his congregation along with the village authorities helped serve food for 800 wedding guests. Some of Ammu's and Ratheesh's family members were present for the wedding, along with all the flood survivors still taking refuge at the relief camp. The new couple along with their family are grateful for the help given to them that made their wedding possible. They would like to personally visit Dr. K.P Yohannan, founder of GFA, to thank him as well. 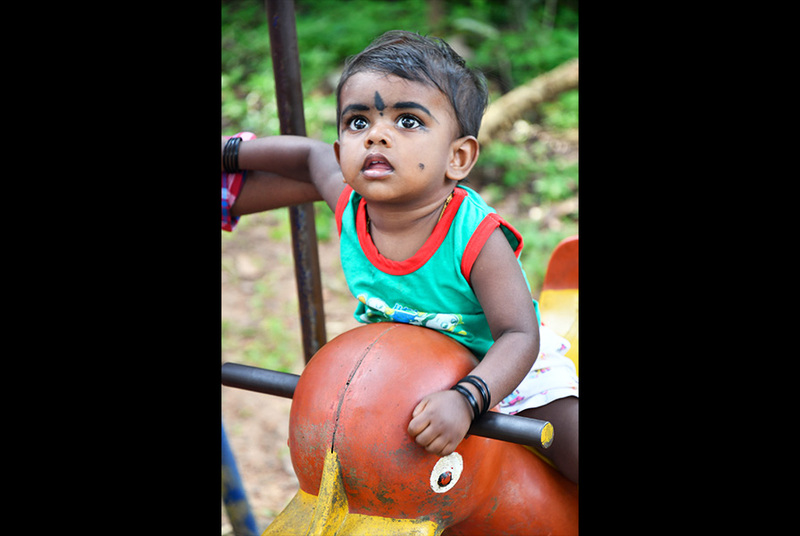 As the people of Kerala recover in the aftermath of the worst flooding in nearly 100 years, the reality of devastation is beginning to sink in—and so is the need to repair, rebuild and start over again. Many residents in this southern Indian state have lost all their belongings—including their means to earn a living. "We could not take anything from our house," she said. "When we left the house, we were empty-handed. We did not take any house items or clothes. We do not have even an extra pair of clothes to change now. Our cow and sheep also died in the flood. We are in a difficult situation." "We had a small stationary shop nearby our house," Jahangir said with tears. "We were able to meet our needs with the income we got from that shop. Now, the shop and the items inside the shop are destroyed. Our house is also damaged. The agriculture land is also under water now." 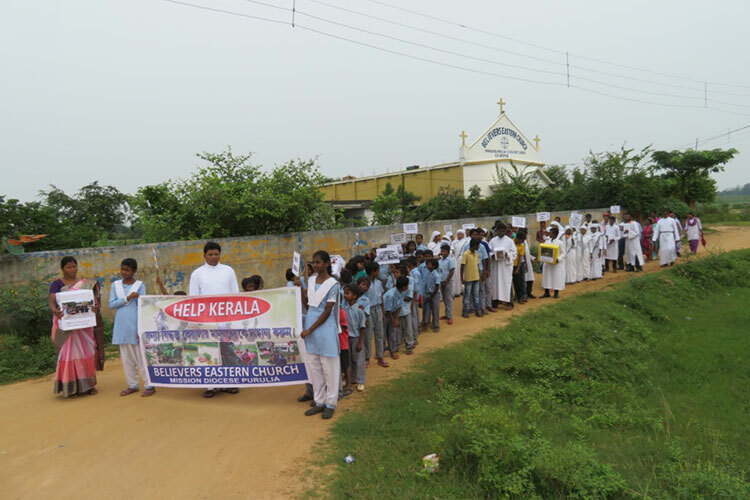 Some Bridge of Hope students located in West Bengal held a banner with the words "Help Kerala" written on it. 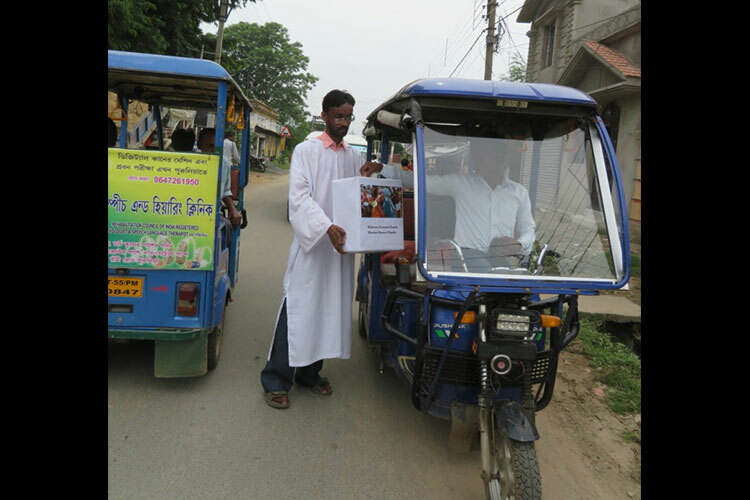 They and local GFA-supported workers were able to raise funds from the villages and communities they rallied in. 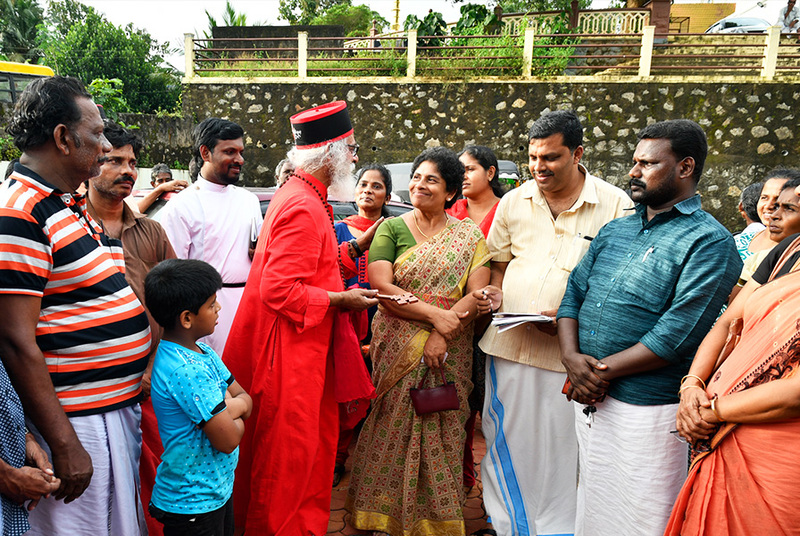 In response to the rally, one villager said, "It is very good initiative to raise the funds for Kerala flood relief work, as they are really in need of our help." “It is easy for me to sit back at home and watch the television and see the different things that are happening. But on the first day when we decided we needed to go help whoever we can, [we got] the idea of using a tractor. … As I moved just away from the main city … it hit me so bad. You could see shops submerged. … Roadside shops, vendor shops completely submerged. Then as we went inside, we saw … 100 people minimum crowding into one house, which would probably hold 10 people. And the only reason [for that was] because all the houses next to them were just single-story houses. Dr. Daniel (pictured on left) shares a lighter moment with the team on one of the first days of the rescue work. “In fact, what made this more real for me was the fact that in one of the rescue boats as we went, we also got stuck there! We were not able to come back. So it was too dark for us to come back, and we couldn’t see anything. Everything was covered in water; we didn’t know [where] the river was, which way the road was. Everything was covered. “So that night we spent on a rooftop under this sheet kind of thing on the rooftop. And one of the first things I realized was that I was completely drenched, even our clothes. … You didn’t know where the food would come from. You actually experienced that kind of feeling that, you know, If the rain doesn’t stop, how am I going to get out of this place? And it was actually really, really pouring out rain that night. If somebody doesn’t come to give me bread, give me water, give me something, how am I going to be here? I have no electricity. I can’t get in touch with my family. How scared would they be? “So I think it hit home for me quite badly. Which meant that we needed to just keep going on and on, trying to help people as far as we could. “What happened was they actually had gone to [a place] about half an hour away from here, which is by the river bank. They were working there in a saw mill, in a place where they make paper. So they went there to make sure the machines were OK and everything was fine. The water rose so rapidly there was no way even boats could go there. Rescue helicopters were the only way to rescue people. But unfortunately, they missed it. The home where the rescue team took refuge overnight. Inside the flooded home, the furniture floats in water. Rescue workers empty water that filled the boat when it rained overnight. After going through so much trauma, Dr. Daniel shared how GFA-supported workers were there for flood survivors to offer comfort however they could. It was these simple acts of kindness and the knowledge that help was on the way that carried many families in Kerala through the immediate helplessness. For some, memories of the flood haunt them. It is with a grateful heart that GFA-supported workers are continually bringing aid to those who need it most right now. They know a lot of the work they are able to offer is possible because of the prayers and gifts of men and women around the world. 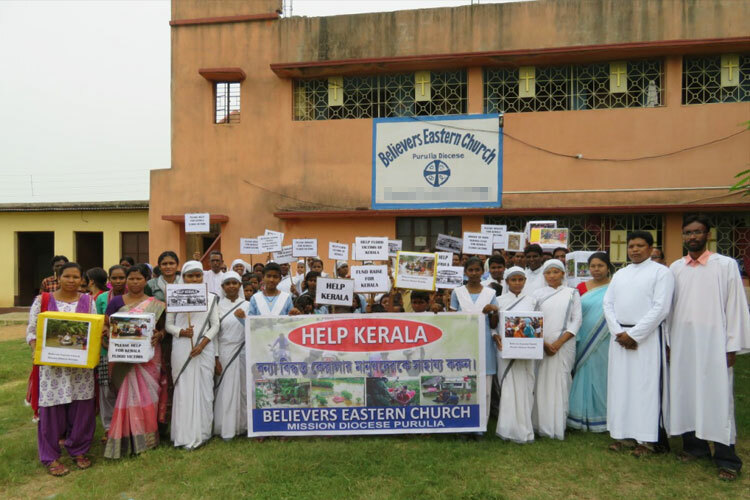 As flood relief efforts continually take place in Kerala, India, GFA-supported workers serving in various locations are raising funds for their brothers and sisters in immediate need. 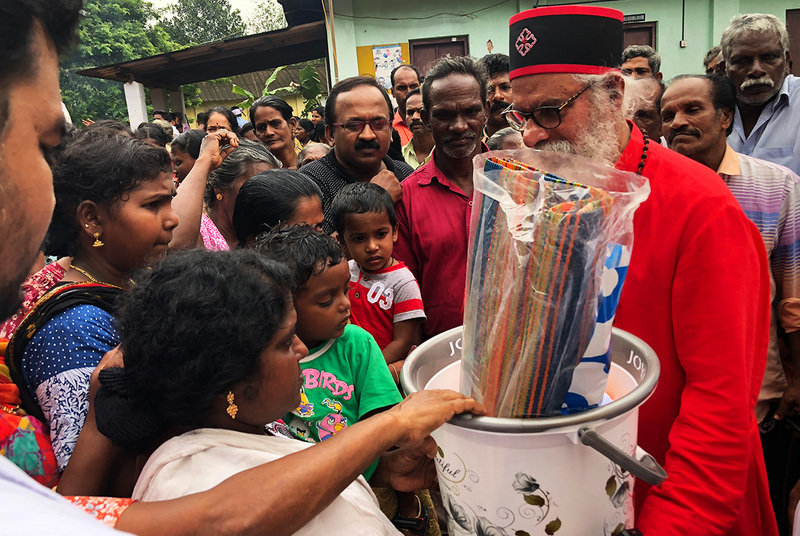 “When I heard the flood situation of Kerala, I felt very sad and immediately visited the mission fields to make contribution for Kerala relief work,” GFA-supported pastor Jai said. 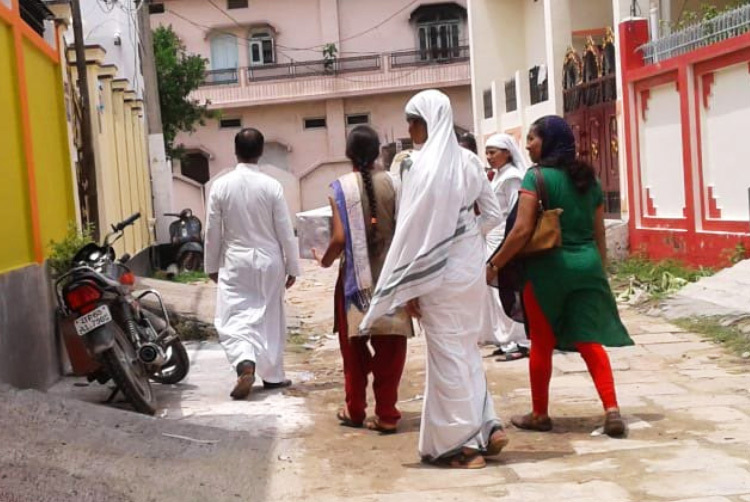 Church members, GFA-supported Sisters of Compassion, pastors and Women’s Fellowships joined together in their spheres of influences, going door-to-door with a donation box, asking their neighbors to give to the relief funds. Handicrafts were also made to sell to raise more funds. 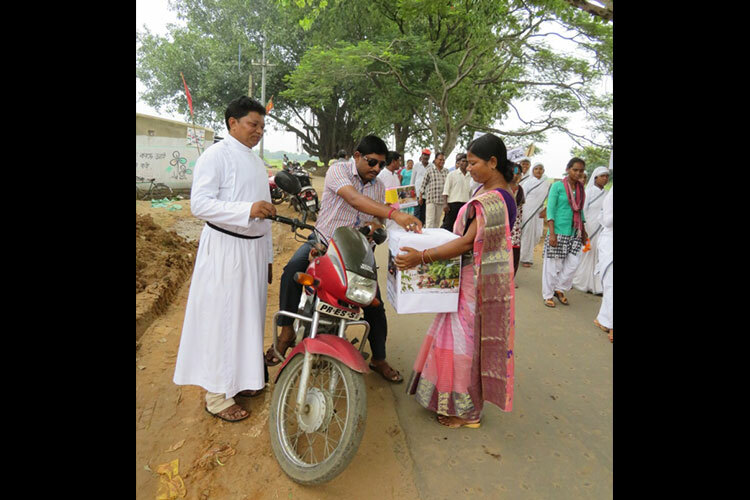 Through their combined efforts, more than 2,000 rupees have been raised by these communities and church members. GFA-supported workers continue to partner with the government to help in any way they can. 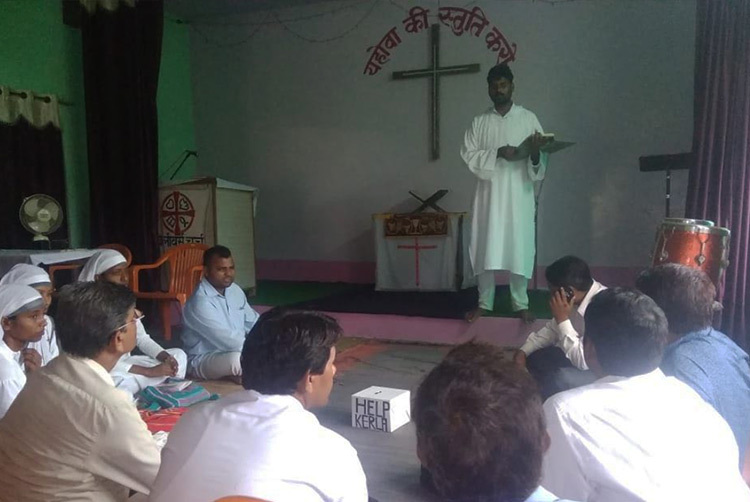 Some churches led by GFA-supported pastors in North India have collected two train cars full of wheat that will be given to the government for its relief kit distributions. Please keep praying for the ongoing flood relief work and consider giving financially to help families get back on their feet, as the floodwaters have stolen many people’s livelihood. 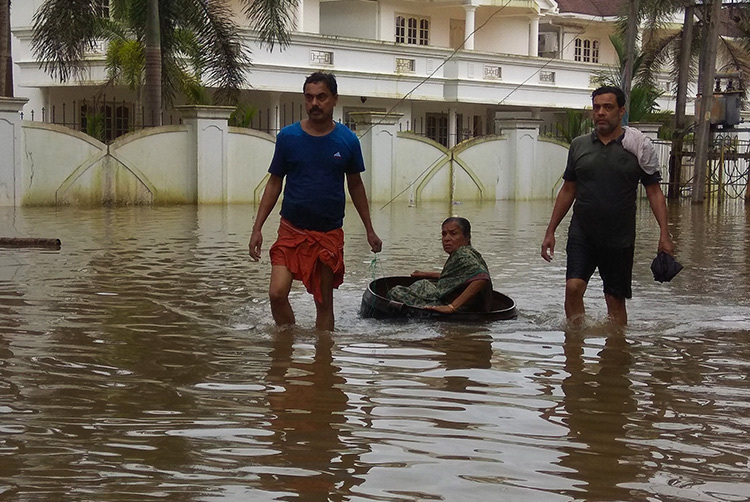 As the flood survivors of Kerala, India, recover from the devastation caused by the massive flooding, GFA-supported workers continue to diligently serve those in need. Congregations led by GFA-supported pastors are stepping in to help in various ways. 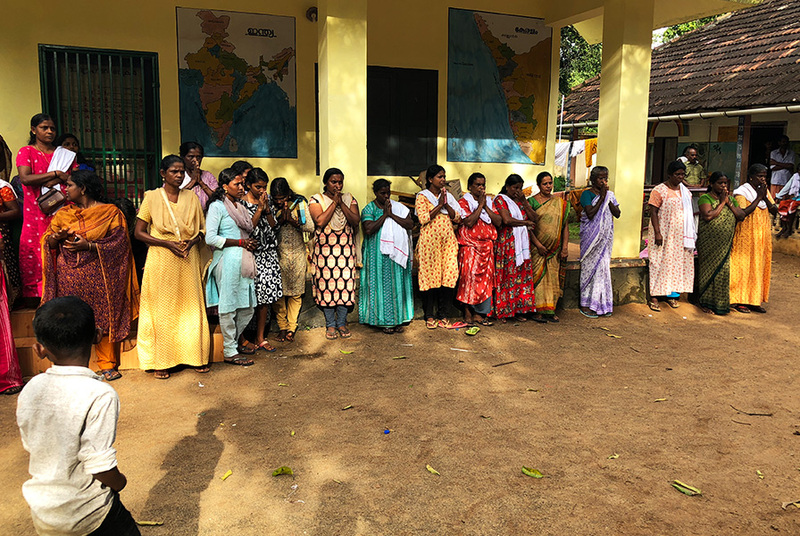 A Women’s Fellowship located in one of the hardest hit places of Kerala helped clean homes of flood-affected families after the waters receded. The Indian government recently asked GFA-supported workers to help them organize relief materials they received from all across the country. 1 Three hundred and fifty GFA volunteers split into two groups at two separate locations, where the items are being sorted. 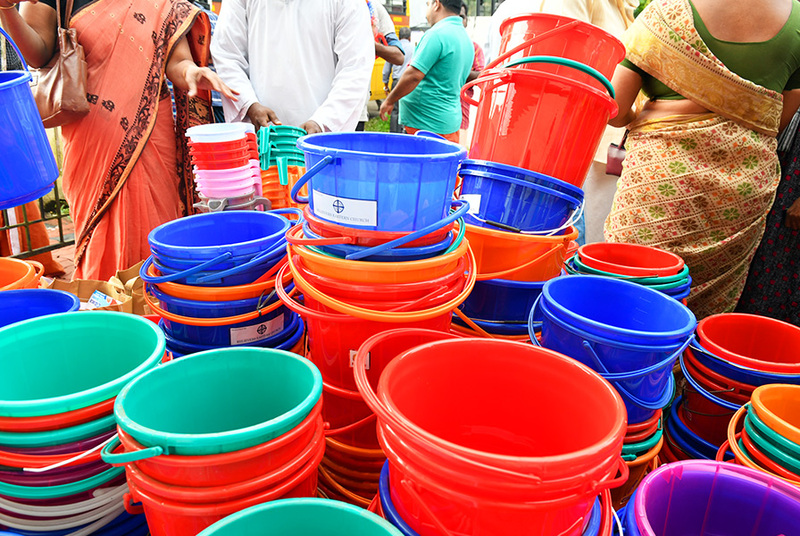 These relief kits contain items like rice, dal, masala powder, coconut oil, clothes, toothbrushes, toothpaste and soap. 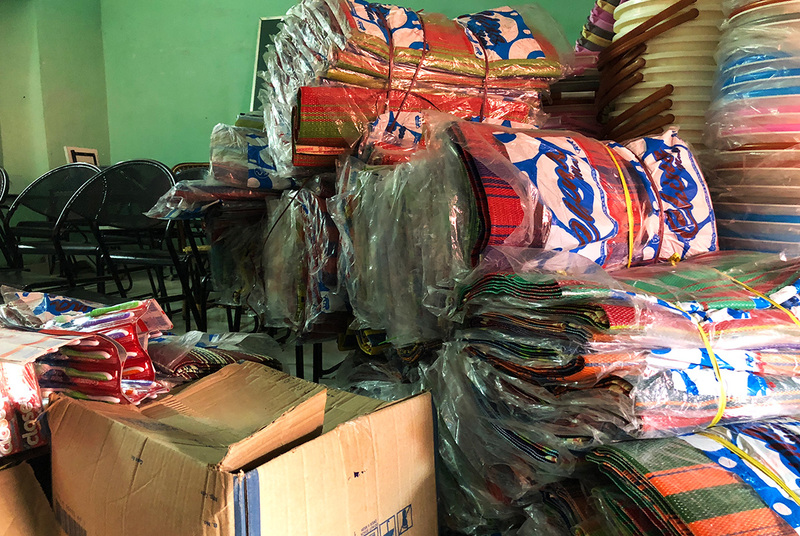 GFA helped prepare enough of these relief items for 14,000 families to jumpstart their lives for a week as they seek to rebuild what was lost in the floodwaters. As Kerala recovers after the worst flood in nearly 100 years, Tamil Nadu, India, now faces a flood that will most likely create massive devastation as thousands of acres of crops are ruined. 2 Already, at least three deaths have been reported, and a flood alert was sounded in more than 11 districts in the state. Evacuation has been taking place, and more than 13,000 people are in relief camps across the state. Please pray for the state of Tamil Nadu. Pray the rain will stop and the floodwaters will recede quickly. Pray there will be minimal destruction for the people of Tamil Nadu. Indira is a mother of three who lost everything in the Kerala Floods. Hear her heart-wrenching story and see what once was her home. Please continue praying for the recovery and rebuilding of these precious families. 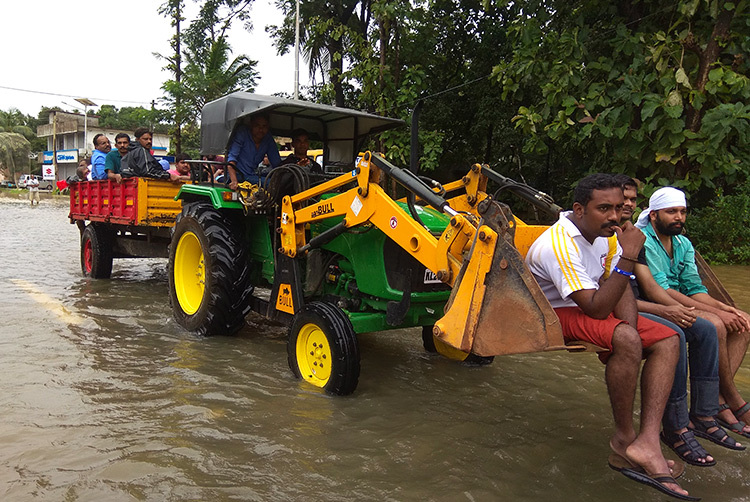 After hearing of monsoon rains ravaging the southern Indian state of Kerala and of the floodwaters that were destroying paddy fields and homes and claiming lives, GFA-supported pastor Jacob, living in Northeast India, immediately mobilized the national workers in his region to help. Although the disaster was thousands of miles away, compassion for those experiencing the terror of this natural disaster, and for those who have lost loved ones, moved on their hearts. 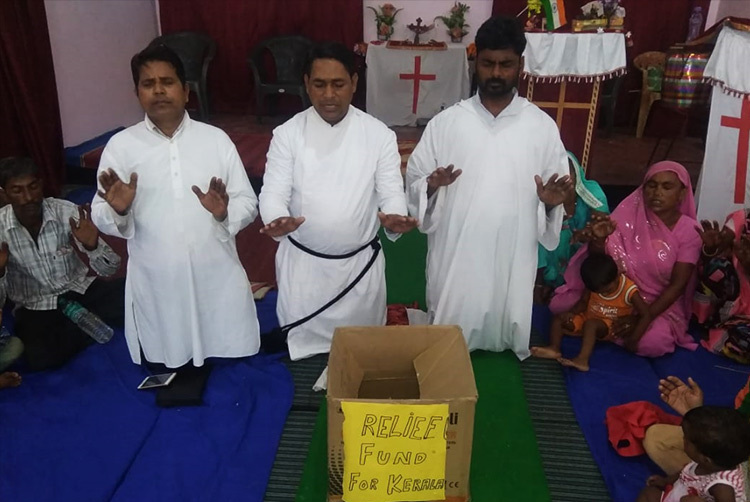 Pastor Jacob and other GFA-supported pastors and national missionaries in his region created donation boxes and went around the marketplace and to shops raising awareness of the plight of the people in Kerala and asking for help. Even though many in this region are impoverished, they were moved with sympathy and gave whatever they could to help those who have lost everything. 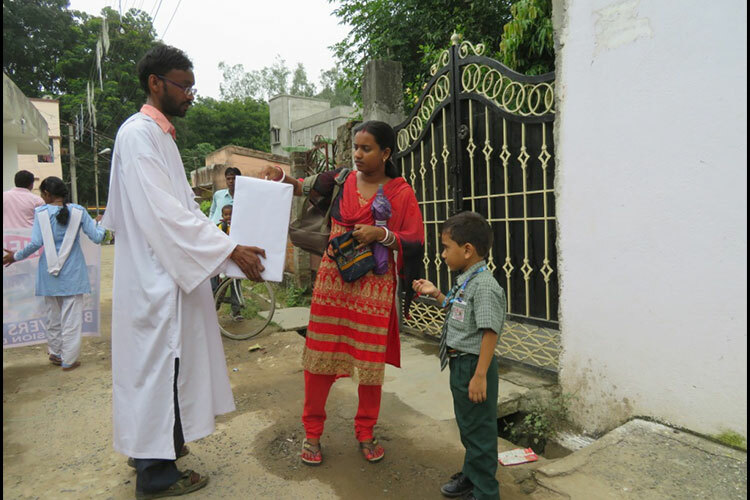 By the end of the day, Pastor Jacob and his team raised nearly 27,600 rupees for the flood survivors. 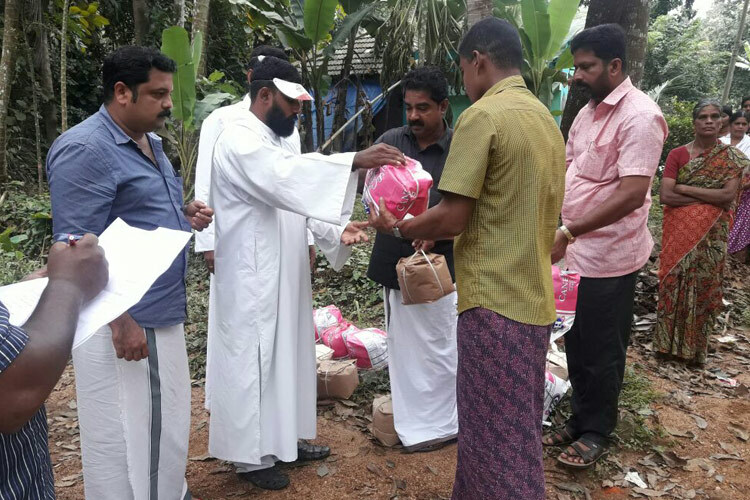 In Kerala, GFA-supported workers, and many others who have stepped in at a moment's notice, continue to provide physical assistance and hope in the name of Jesus to those now living in relief camps. 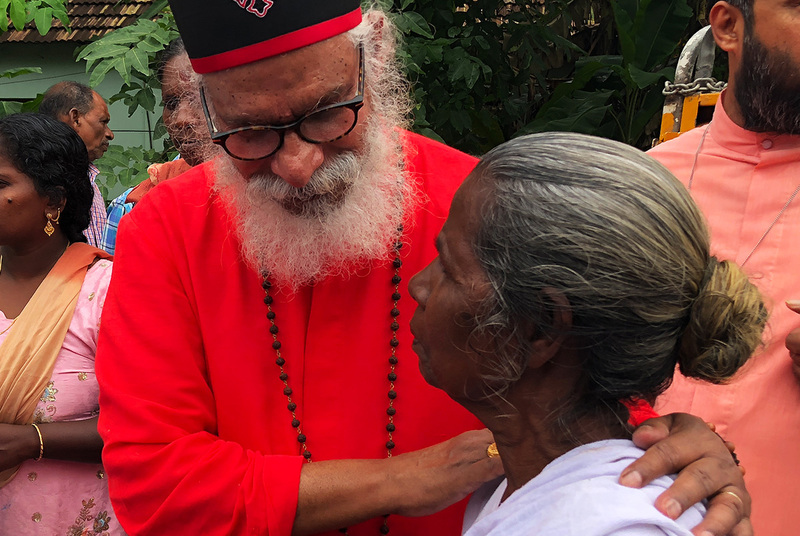 Dr. K.P Yohannan, founder of GFA, and one GFA-supported relief team were able to link arms with a wealthy family in the area, who are housing and caring for families who have been misplaced due to the floodwaters. They were able to provide 100 families taking shelter at this refugee location with basic relief items and cleaning supplies, such as soap, brooms and wipers to assist in house clean-up once the floodwaters recede. These items have been a blessing to the flood-affected families. 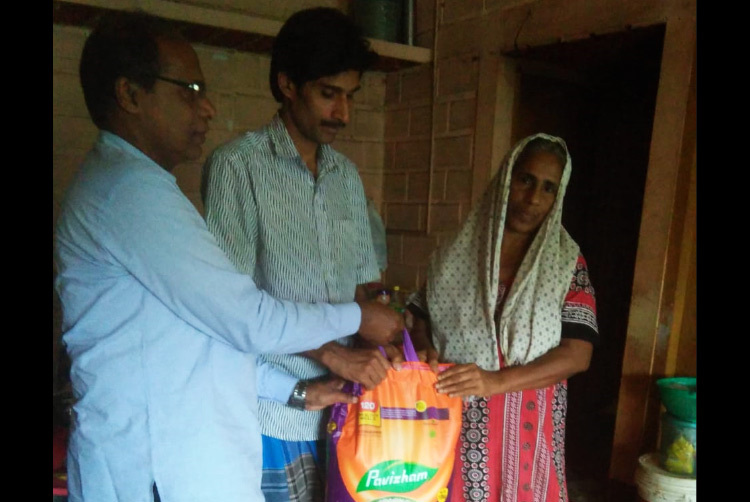 Yohannan has been active in comforting flood victims with encouraging words and prayer, as well as handing out relief items to help families get back on their feet. At one relief camp with more than 500 people, he presented people with bedsheets, mats, buckets, soap, toothbrushes and other items. 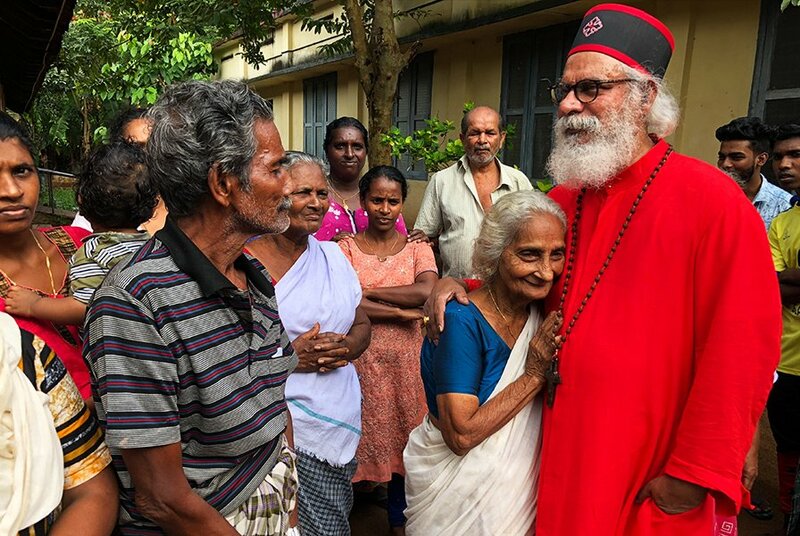 "Kerala has experienced an unexpected flood and loss," he said, "but the Church will stand with the affected people and will help them in whatever way possible." 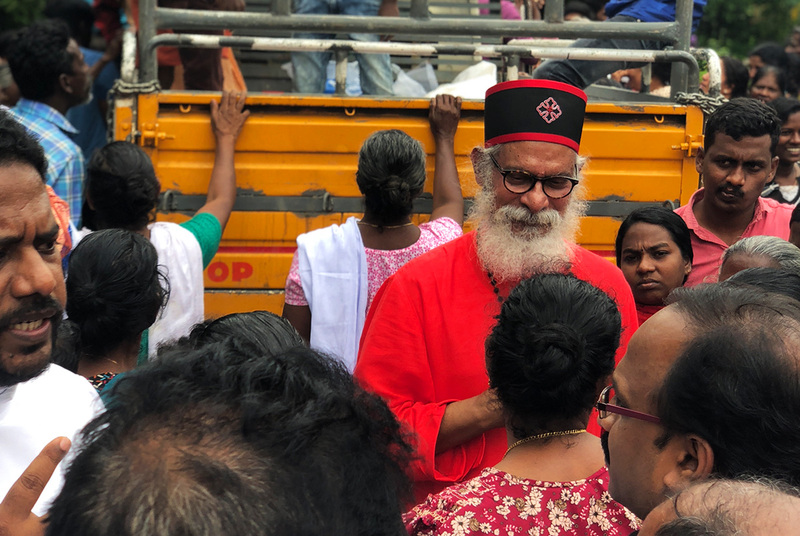 At another relief camp Yohannan visited, he drew attention to the youth present, who were sacrificing their time and resources to help others in need. 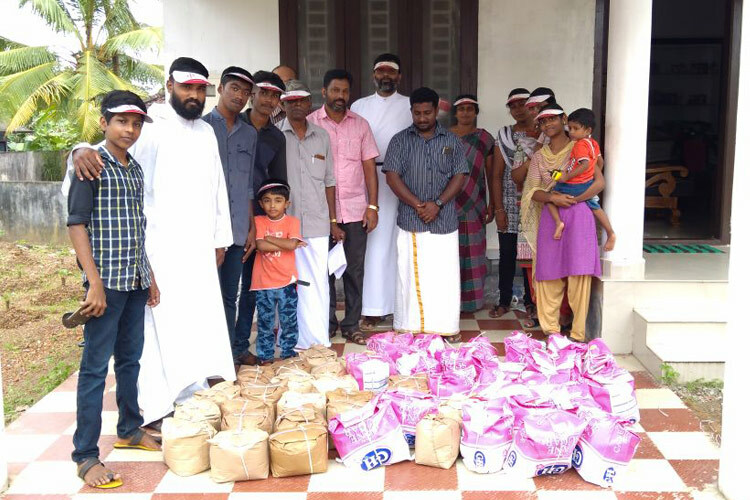 "One of the amazing thing we experience during this huge, catastrophic event in Kerala is the young people are giving their time to serve food and other items to help people. I have also heard the stories of young people who are taking vehicles and moving from place to place and rescuing the people. I thank God for the young people in our community. It is a good sign that the youths are growing with compassion and concern for others." 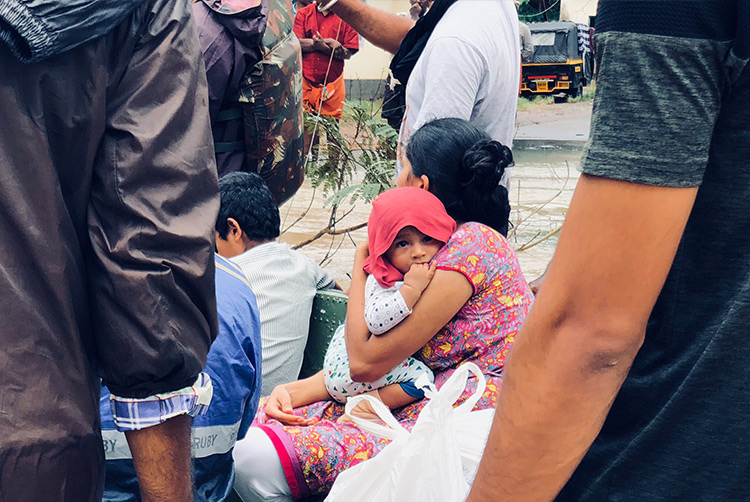 Please continue to pray for the ongoing relief work that is taking place, not only in Kerala but also across the country, as many states in India step in to help the flood survivors rebuild their lives after the waters stole much from them. One farmer, after receiving relief supplies, said, "My family is staying in the relief camp for four days. Our house is filled with water. I lost my paddy field and crops." Please consider giving a donation to help people like this farmer and many others who are living with hopelessness. 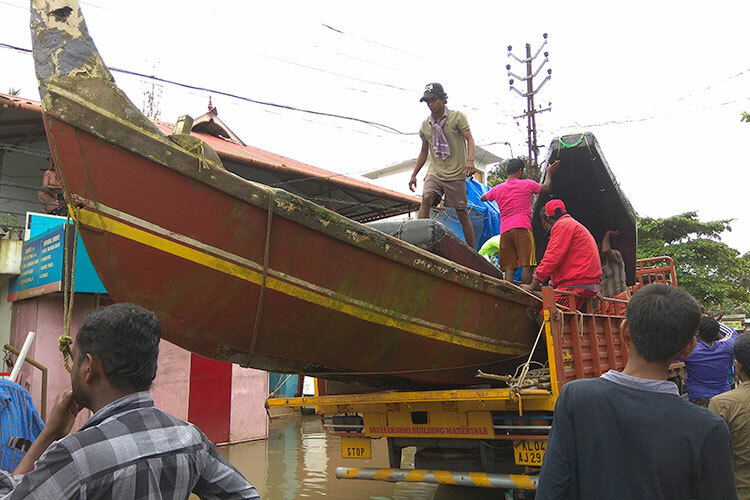 After hearing about the monsoon flooding in Kerala, India, the Mission Support Team serving at GFA's headquarters in Wills Point, Texas, sprang to action to help spread awareness of the timely need. Many shifted their schedules to work long hours through the weekend to bring awareness to the devastation many are currently facing. 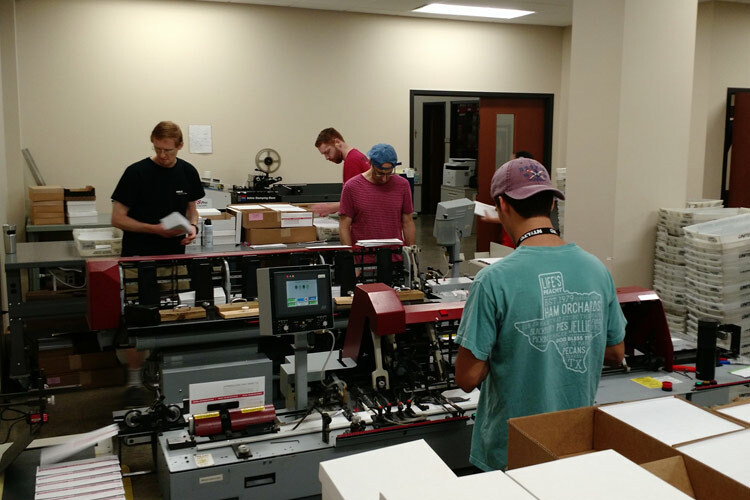 After receiving a firsthand disaster-relief report from Dr. K.P Yohannan, founder of GFA, behind-the-scenes missionaries printed, folded, stuffed, stamped and sent out the passionate plea to believers across the United States. "Along with a few co-workers," Shawn, a behind-the-scenes missionary, said, "I coordinated the printing and mailing of this letter. 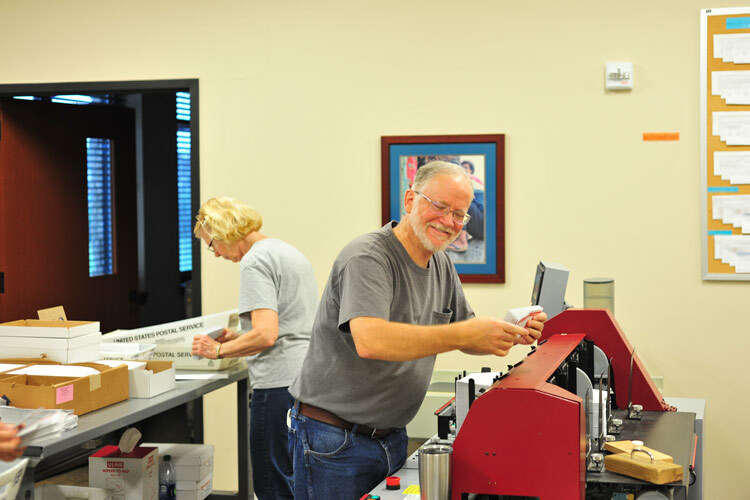 This involved running our printers for many hours, communicating with the post office and other companies to send out the mail, training volunteers how to use machines, fixing broken machines and answering questions." Behind-the-scenes missionaries from every corner of the office contributed to the efforts, doing whatever was needed, which may have been tasks that they had never done before. "When I had the opportunity to volunteer in our mail room to help with the disaster-gram mailing, it was such a joy to know that doing something as seemingly simple as working with thousands of pieces of paper would make a difference for the lives of those suffering in the floodwaters," said Grace, who serves in GFA's IT department. 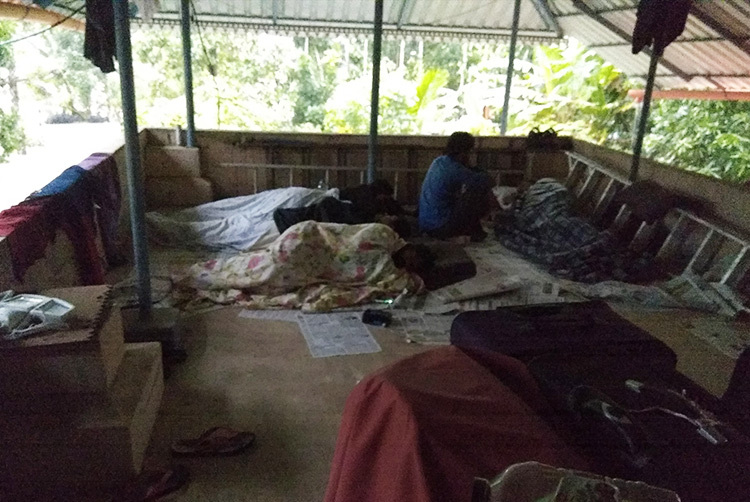 While the print room was buzzing with activity from 6 a.m. to midnight on Saturday, Aug. 18, GFA social media specialists, writers and web developers were disseminating, throughout the digital world, reports and videos received from national workers serving in Kerala. 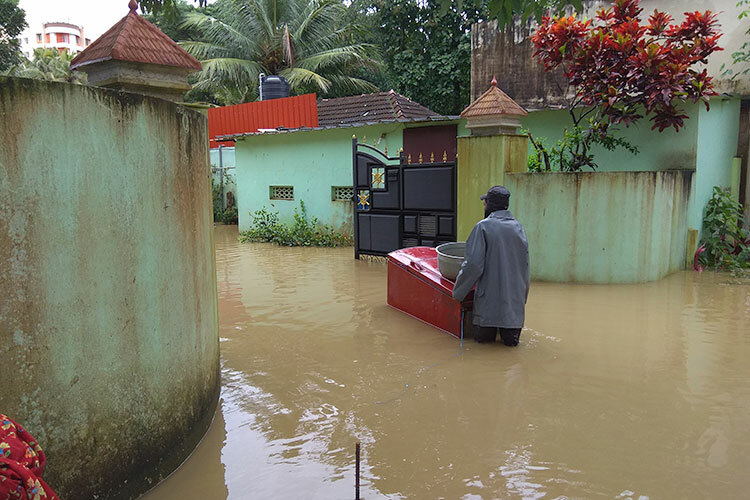 "I spent most of my time creating Facebook ads to create awareness about the Kerala floods and to encourage people to help," said Anna Beth, a GFA campaign manager. 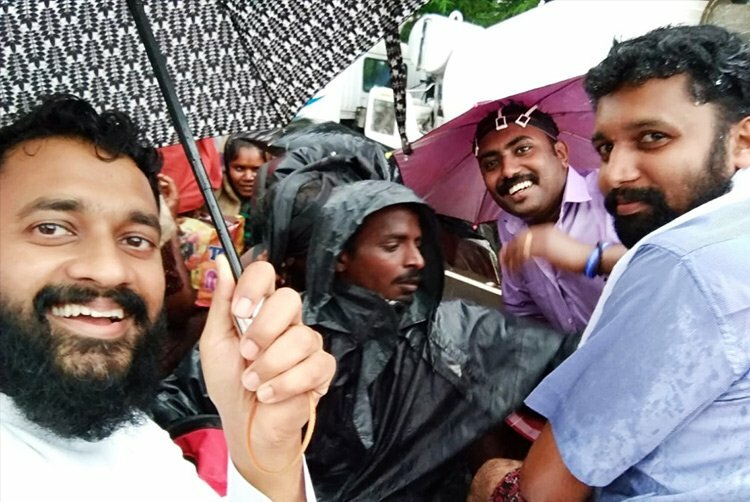 As GFA-supported workers in Kerala rescued stranded people in neck-deep floodwaters, distributed relief items and served around the clock in medical camps, behind-the scenes missionaries worked along with them. They felt it was their privilege to help in the relief efforts, even from the other side of the globe. "I tried to put myself in their shoes," said Rachael, a behind-the-scenes missionary. "I have an infant, and I can imagine how overwhelming it would be trying to keep him protected, warm and dry, fed and safe from sickness, like waterborne illnesses. This motivated me to pray, and it was a privilege to help for a couple hours too." As behind-the-scenes missionaries served, they enjoyed lighthearted fellowship with each other, even though they were working in the middle of disaster. 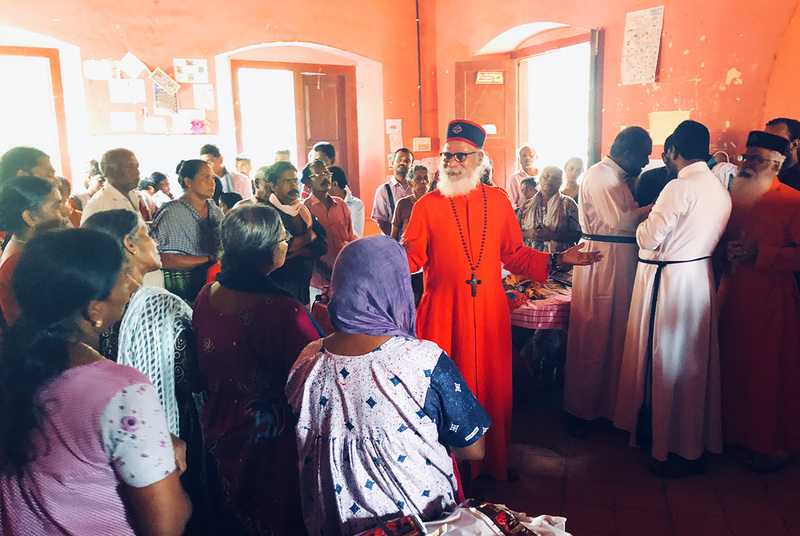 They knew there were many busy in Kerala, working hard to bring aid, and the behind-the-scenes missionaries also stepped up to work together with prayerful hearts. "Being in the moment, I enjoyed standing by others, laughing and working yet in a time of crisis," said Christian, who works in GFA's call center. "I blinked once or twice, staring at the letters in front of me and wondering who the person was who would receive the letter. I prayed for the people receiving the letters, and I prayed for the people who would be helped on the field." 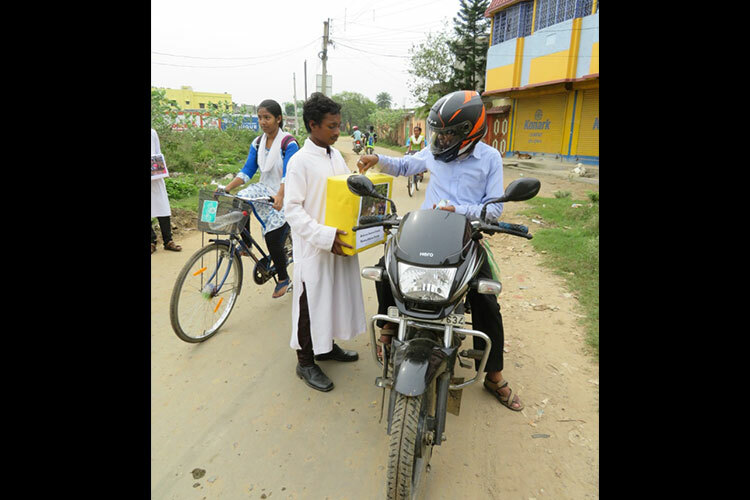 Driven by the same love and passion as those they serve in Asia, behind-the-scenes missionaries saw this as a special opportunity to give their personal time for the Lord and for the broken and needy.  It was a chance for them to express their love for God and the people in need with their actions. The leaders of Gospel for Asia were often present to help out and encourage the missionaries as they served. "Daniel [vice president of GFA] said our work was an act of worship," Christian recalls. "I don't remember praising God as I let the envelopes fall into the machine. But the presence of others around me and the joy I saw in others to complete menial tasks deep into the night—God's presence was there, just as it is on the field, comforting the broken and hurting, especially those who have lost everything: friends, family, homes, livestock." It is the common goal, and love for the people they have chosen to serve in Christ, that continues to keep the missionaries on the field and the missionaries behind the scenes going. For some, this crisis and the ability to help raise awareness was a key connection between them and the brothers and sisters across the globe. 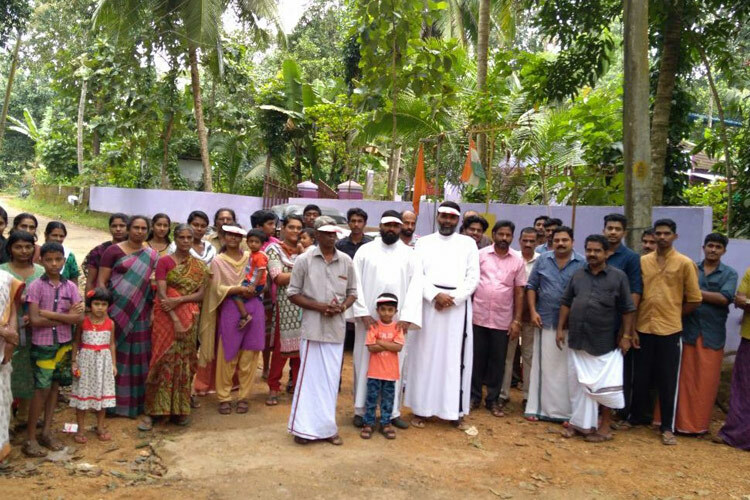 Although their cultures, their languages and their roles in the catastrophe, are different, the love for God and the people of Kerala united people in a deeper way. "I would say to the people of Kerala, 'This is not the end—take courage,' " Shawn said. "And for us who are not affected by the flooding, we can pray and give. We can reach out our hand and, in a way, touch someone on the other side of the world. Jesus said, 'I am the light of the world,' and He also said to His followers, 'You are the light of the world.' We are to represent Jesus, here in 2018. Serving the people of Kerala is one way we can do that." Please consider opening your hearts to give to those affected by the flood in Kerala, as ongoing relief efforts have only begun and many lives have a long way to recover any normalcy. 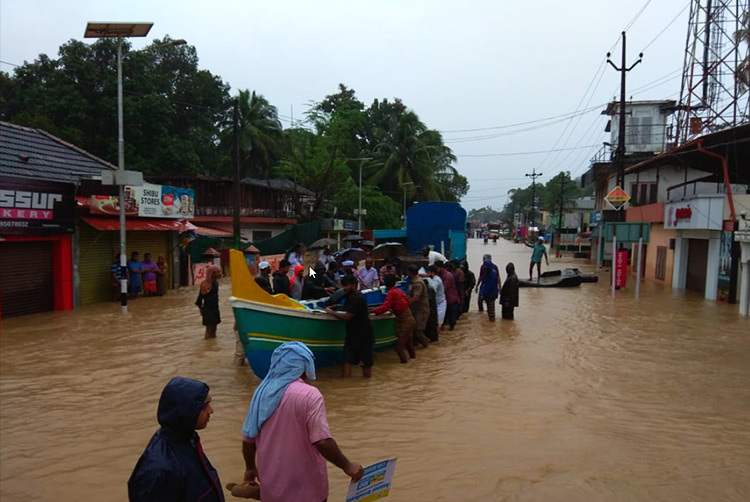 Along with many heroic efforts from the armed forces, various rescue teams, fishermen1 and locals serving as guides to the more remote areas in Kerala, India, GFA-supported Bridge of Hope staff members have stepped in to help families and children after the terrible monsoon flooding. 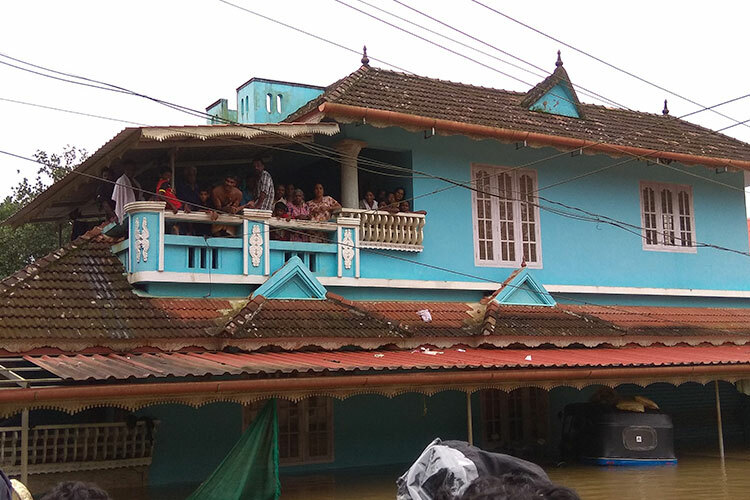 Approximately 191 enrolled students in Bridge of Hope centers in Kerala were evacuated to higher ground along with their families while floodwaters destroyed and ruined their homes. Bridge of Hope staff brought supplies and a loving smile to many in relief camps in some of the most affected areas. They distributed items such as blankets, firewood, clothing, food kits, plates and glasses. In one camp, the staff was able to serve 225 people a meal. They also cleaned people's homes. As the floodwaters slowly recede, relief efforts remain. But many are left desolate, with no home to return to. 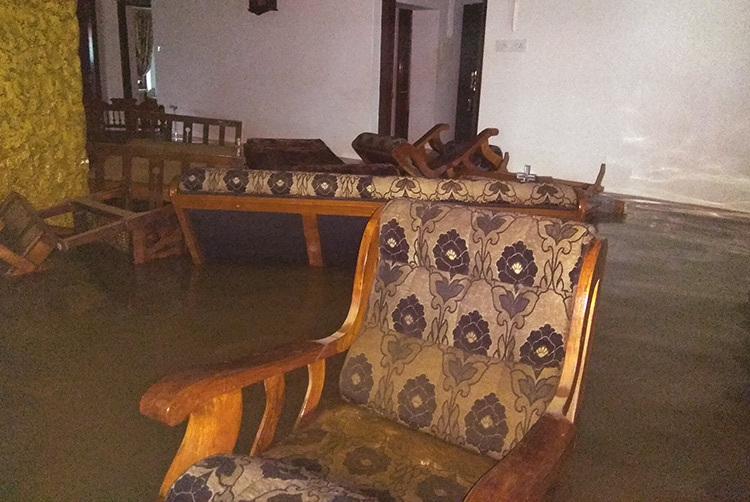 The people of Kerala are now hard at work cleaning out what is left of their homes, but the real scare and fear lie within the stagnant floodwaters. 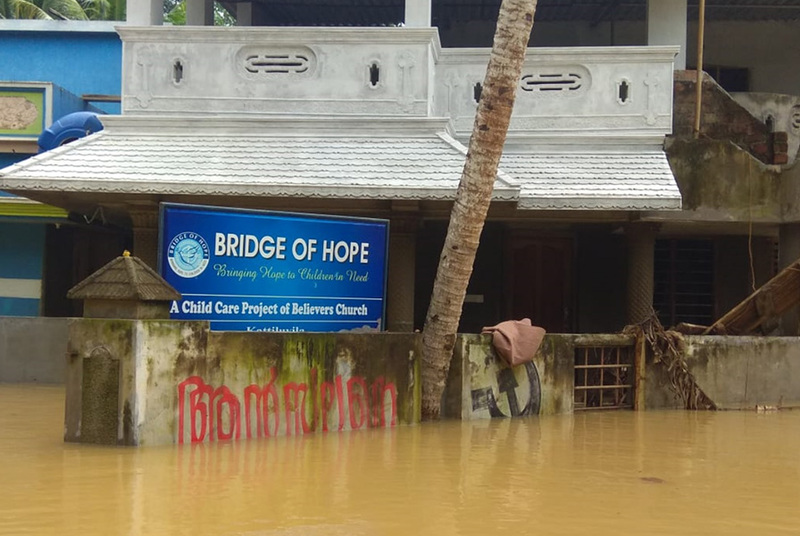 A flooded GFA-supported Bridge of Hope center in Kerala. Chief Minister of Kerala, Pinarayi Vijayan, stated, "The focus of the state government will be to bring life back to normalcy even as rescuing the people stranded in remote areas continues. Rehabilitation of the affected will be taken up with the cooperation of the local people." Please pray that sicknesses and disease will be minimal as the people in Kerala now wait to rebuild their lives and livelihoods. Please consider helping the ongoing relief efforts made by hundreds of GFA-supported workers by giving toward the Disaster Relief Fund. 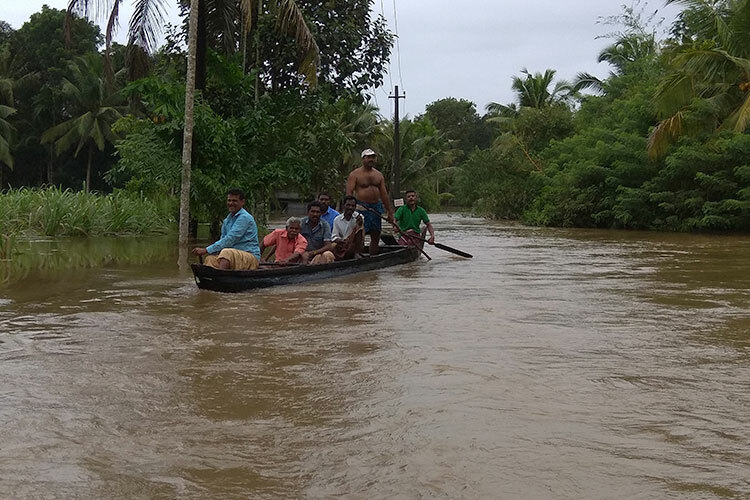 The heavy rains have mostly subsided in Kerala, India, and now, the red alert has been lifted in all 14 districts.1 Even though the rains have stopped in most parts of Kerala, ongoing rescue operations continue, saving those who are stranded. 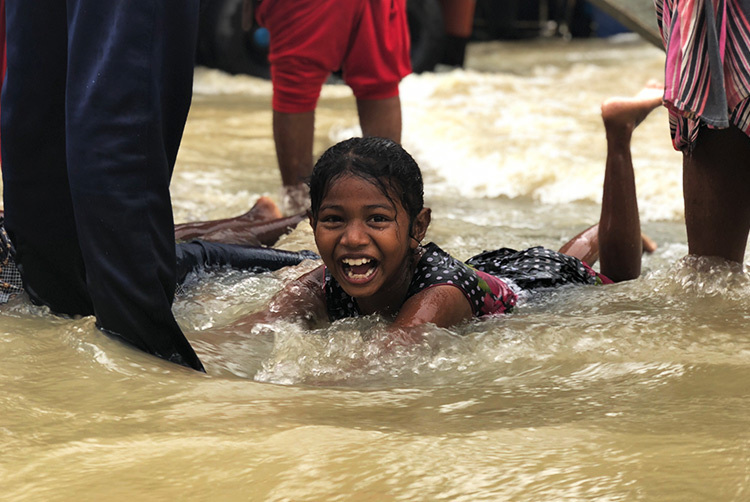 GFA-supported relief teams have been hard at work, caring for the needy and suffering who have literally lost everything in this devastating monsoon. Now, more than 600,000 people have taken shelter in relief camps throughout Kerala.2 GFA-supported workers and relief teams have visited numerous camps, passing out food and water. They’ve also partnered with health authorities to provide medicines and epidemic-prevention aid. 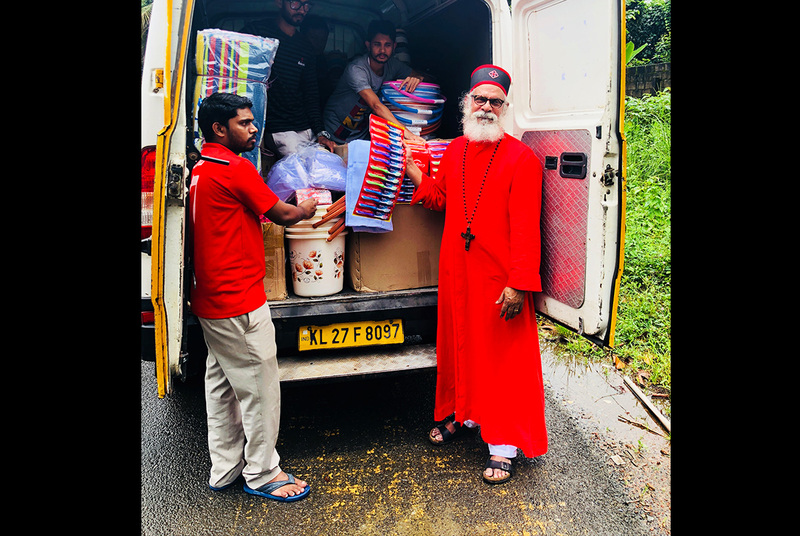 Kerala’s resilient spirit has only been boosted due to the aid of many states in India, who have been sending relief supplies and food, often offering free transportation of these items.1 Staff at GFA-supported Bridge of Hope centers are also handing out relief items. Please continue to pray and give of your resources to help those in desperate need today. This flooding has devasted crops and completely ruined homes. It will take the helping hands of many around the world for the people of Kerala to get their feet back on dry ground. More than 300 deaths have now been reported from the monsoon rains and flooding that have devastated Kerala, India. Many rescue teams had to stop after dusk yesterday because the currents were too risky for teams to venture out successfully. According to the chief minister of Kerala, Pinarayi Vijayan, a total of 82,442 rescues were made on Friday. There still remain some who are patiently waiting for helicopters to bring them to safety. Many of these people have been without food and water for three days. Dr. K.P. 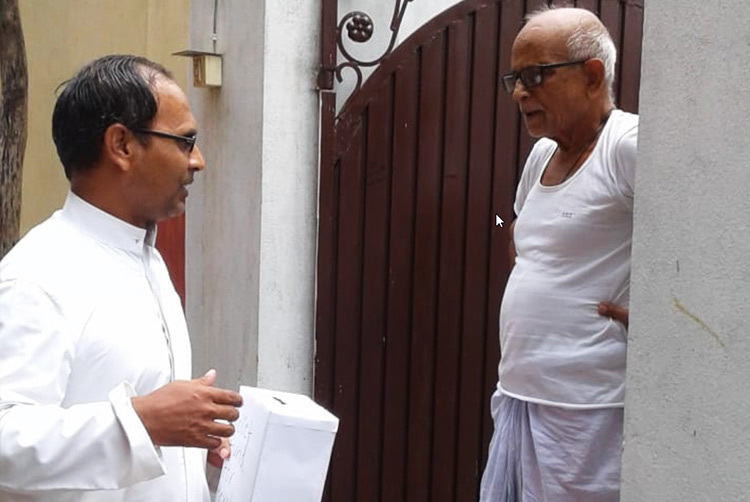 Yohannan, founder of GFA, helped with relief efforts, distributing items such as clothing, towels, buckets, toothpaste and toothbrushes, soap and sanitary napkins. 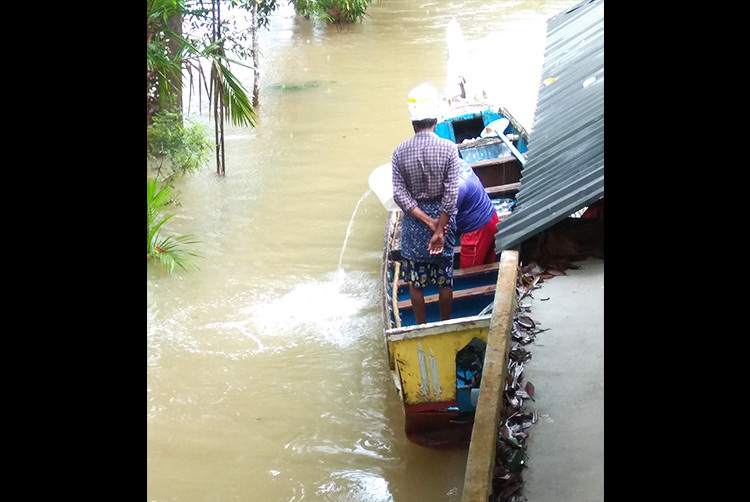 GFA-supported workers arranged 15 boats with crews to rescue those who are trapped and surrounded by water. They are coordinating with the local authorities on operations to reach the more interior and remote places that have been flooded. Please continue to pray as relief efforts are going forward. Pray for the churches and the government as everyone reaches out to help each other during this time of crisis. Please remember those in Kerala who are suffering today because of this crisis. 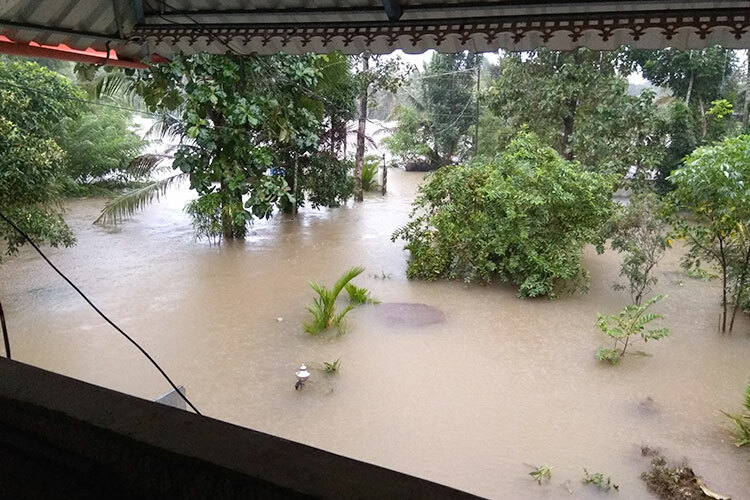 Kerala, India, continues to face peril as the monsoon rains destroy homes, paddy fields and businesses. The death toll has risen, as reports are now estimating well over 100 lives have been lost1, while some people are missing. Some houses are under 10 feet of water. Many people are still being rescued by helicopter after scrambling to the top of their homes2. GFA-supported relief teams are already in action, delivering supplies to those they can reach. One man shared about the rescue mission he and some GFA-supported workers endured to save his mother-in-law and some of her neighbors. 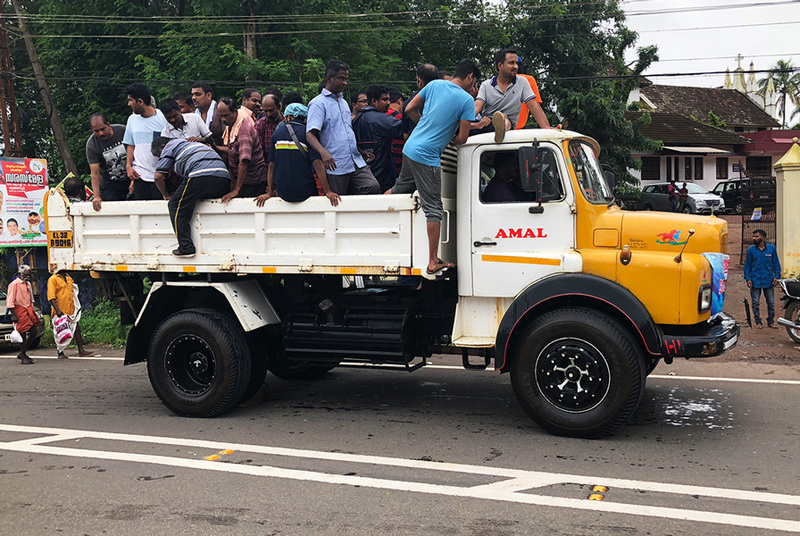 Survivors rescued from Kerala floods arrive at a relief camp. This man and the rescue team were successful, and his mother-in-law and some of her neighbors are now in safety. Please continue to pray as the waters rise and more people lose hope for their future livelihood. The people of Kerala are suffering greatly and are crying out for immediate aid. Please open your hearts to join the rescue efforts and give to our Disaster Relief Fund to help those in desperate need. 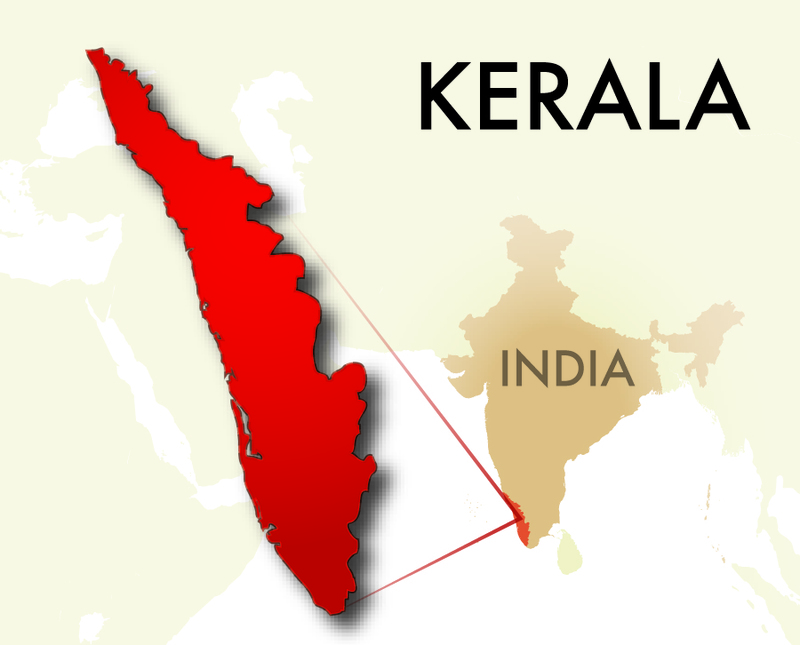 Kerala, India, is experiencing monsoon rains that have not been seen or experienced since 1924. Reports estimate that 70 to 100 lives have been taken due to the floodwaters. Many homes and businesses have been washed away by severe landslides and rivers overflowing because of the constant downpour. For the first time in its history, the shutters of 35 of Kerala’s 39 dams have been opened to keep the dams from erupting, which would inevitably create even more destruction. According to the Indian Express, the Indian navy has begun to airlift many trapped people who climbed for safety on top of their homes or to hilly areas, rescuing them from the engulfing floodwaters surrounding their homes. Many have lost their livelihoods while escaping with only the clothes on their backs. 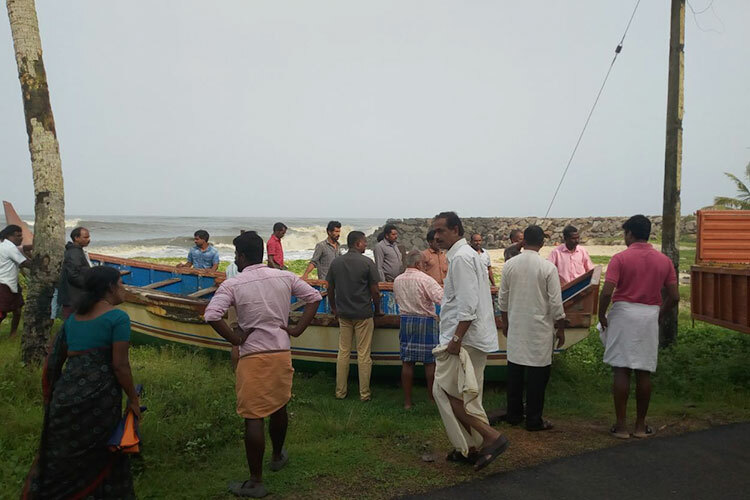 The once bustling Cochin airport has now been shut down due to the flooding, and a red alert has been issued throughout the 14 districts of the state of Kerala. Many roads, including some main highways, are covered by floodwaters, making transportation very difficult. It is becoming more and more impossible to travel as the rain continues. 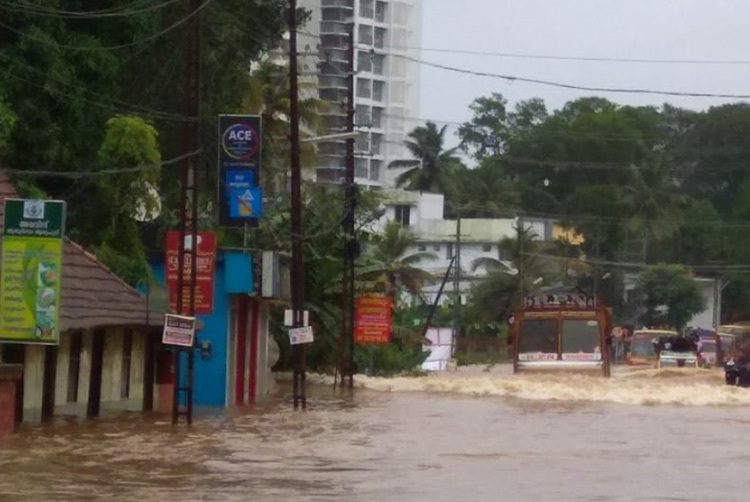 Kerala, aside from all the relief teams working, is at a standstill, as life is threatened to be washed away by the ever-growing water disaster. One of Kerala’s largest festivals, called Onam, has been cancelled as the local officials are calling the people to use their money to help fund relief work instead of purchasing fireworks and other items they would use to celebrate. Kerala is now in emergency mode. Schools located on higher ground and secure church buildings are being used as places of refuge for flood survivors, while many more people are currently in relief camps. GFA-supported workers in the area are involved in helping those around them even as they experience the devastation of loss. 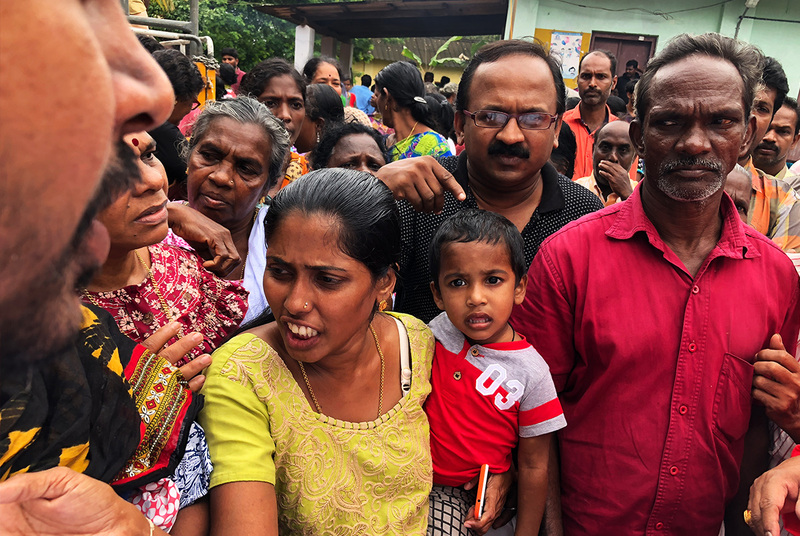 Churches led by GFA-supported pastors all across Asia will be supplying relief items, such as food, water and clothing, to those in need in Kerala. As we see throughout Scripture and in Jesus’s ministry on earth, we know that God is a God of compassion and mercy. Please extend your hand to help those who are in need right now. There are many who are enduring the sorrow of extreme loss and suffering today. You can be part of the hands and feet of Christ by partnering with GFA-supported disaster-relief teams that are offering aid to those in need. Please take a few moments to pray and to consider sending help that is extremely needed today.